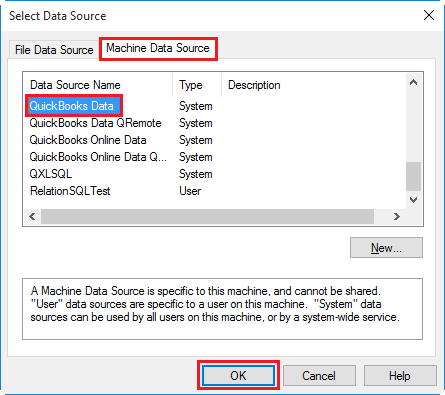 The Test Connection in the QODBC Setup Screen comes back saying it is connected, and the VB Demo returns results, but Excel crashes as soon as you select using the QuickBooks Data* Database option in the connection wizard. Cannot get data connections to work with either Access or Excel 2013 32-bit. Environment: MS Office 2013/365/2016, QuickBooks 2013, Windows 7 or Above. 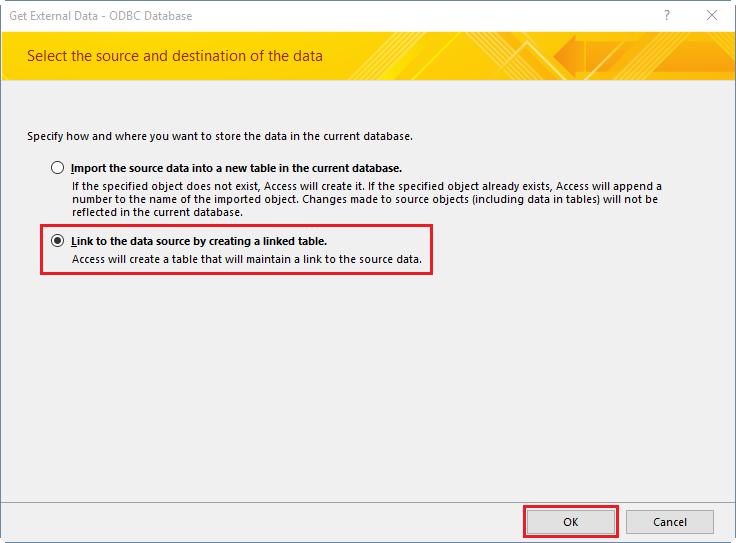 When connecting with VB Demo able to connect but when using Excel or Access QODBC shows error "RegFile1 License error"
One time activity, Run Excel/Access and QuickBooks ( Both ) as Elevated (Run as Administrator), connect once. 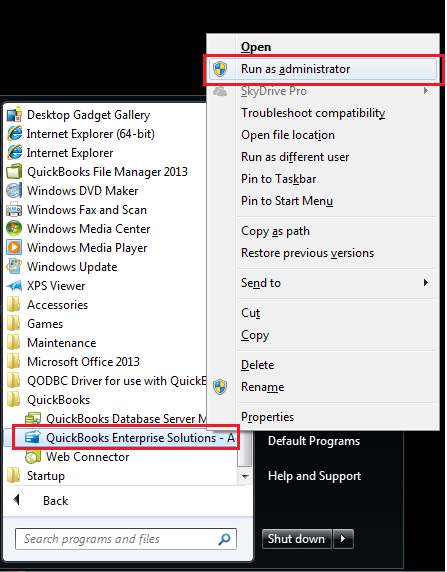 After its connected, you can run Excel/Access and QuickBooks in normal mode. Make sure QBW32.exe, msaccess.exe, msexcel.exe, access.exe, excel.exe is NOT running. 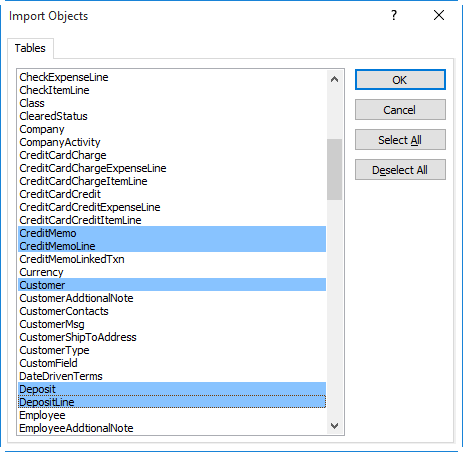 Right Click on QuickBooks and Click "Run As Administrator"
Import the source data into a new table in the current database: this option will directly extract tables into Access Database, you can view and edit these tables, but all modification will not be uploaded unless you build another query to do so. I tried in excel first and the process did not work. SO....I followed instructions to the letter in access. Got it in access, then it worked in excel. not sure the sequence I used matters. Anyway. Due to some security added to Office 2013, QuickBooks and Excel/Access 2013 needs to be started as "Run As Administrator". This activity is only once. Quickbooks can't start because its already running. Only Quickbook accountant can open more than one company file. I guess this is coming from QODBC driver? Hi, I have tried this with Excel but can't get it to work. I don't have Access on the machine in question. 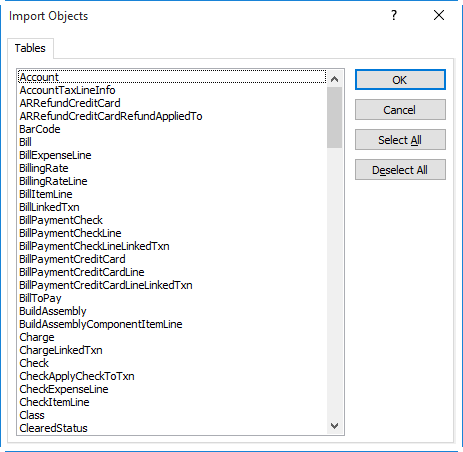 If I Run QB (Accounts Premier 2013) and Excel 2013 both as Administrator and then attempt to add a new data connection via MS Query, I get a "Error 80040408 - could not start Quickbooks" message. I would like to suggest you that above activity is one time only. If you run both QuickBooks & MS Excel/Access as a administrator and you are not getting "RegFile1 License error" then please run QuickBooks & MS Excel both as contexted user & try to connect. I following the steps and after I grant Permission a window appears stating that the license will expire in 30 days. Then MS Access displays a mess ODBC--Call Failed [QODBCPOS] Evaluation License has Expired! Please contact your dealer for the latest version. Then nothing else! I perform the steps and get it to work and then some time later (days) the error comes back. I don't know it until I am running my process to transfer data over to QB. I have to redo the "fix". Is there a longterm solution or any ideas why this keeps coming back? 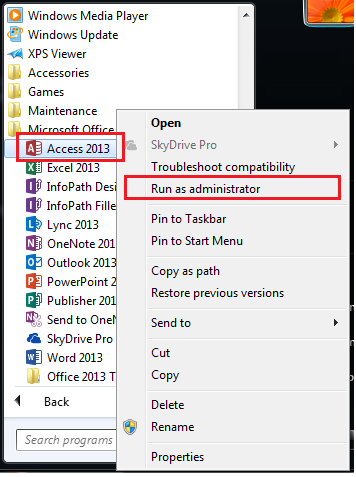 Due to some security added to Office 2013, QuickBooks and Excel/Access 2013 needs to be started as "Run As Administrator". This activity is only once. 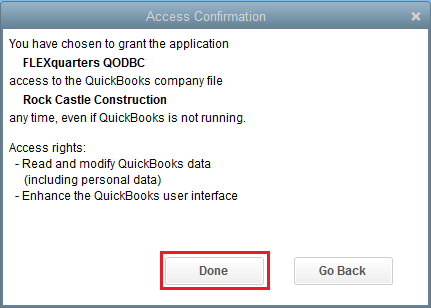 If you update QuickBooks or QODBC, then you need to repeat this process. 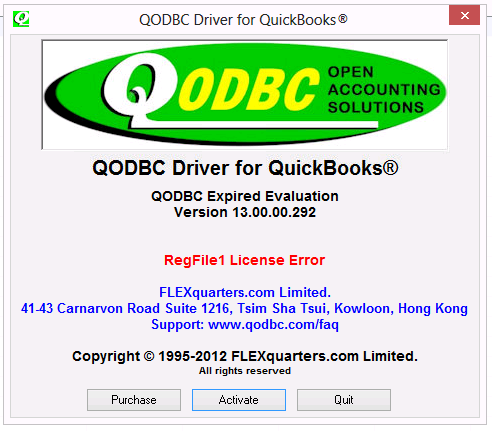 I kindly request you to download QODBC version v15.0.0.307 from below link. 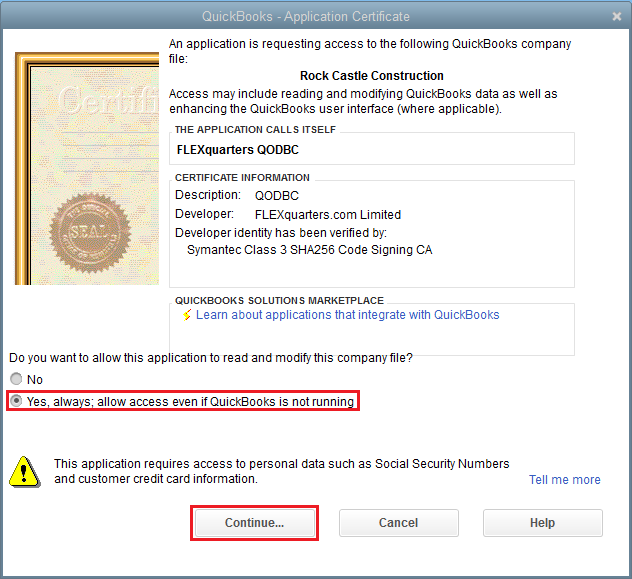 Go to QODBC Setup Screen->”About” window to see if the version change is applied. After successfully installation of new version QODBC & QRemote, please test the reported issue & share outcome.